GA-ASI’s company-owned MQ-9B SkyGuardian is in flight, bound for Royal Air Force (RAF) Fairford in Gloucestershire, UK, where it is scheduled to land at approximately 6:45 p.m. local time (GMT+1) on July 11th. Over the past 10 years, the RAF has operated GA-ASI’s MQ-9 Reapers in various theatres of operation. The RAF is celebrating its 100-year anniversary (RAF100), and to commemorate the event GA-ASI is flying SkyGuardian to RAF Fairford, where the Royal International Air Tattoo (RIAT) airshow will be held July 13-15. SkyGuardian will be on static display during the show. The RAF is acquiring MQ-9B for its PROTECTOR RG Mk1 program. MQ-9B is the new generation of GA-ASI’s multi-mission Predator B product line. The company named its baseline MQ-9B aircraft SkyGuardian, and the maritime surveillance variant SeaGuardian. 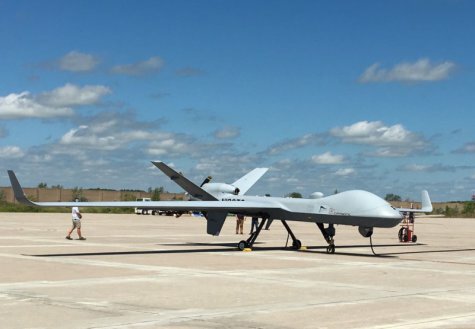 MQ-9B is a “certifiable” (STANAG 4671-compliant) version of the Predator B product line. Its development is the result of a five-year, company-funded effort to deliver an RPA system that can meet the stringent airworthiness type-certification requirements of various military and civil authorities, including the UK Military Airworthiness Authority (MAA) and the U.S. FAA.